Believe it or not but Escape from Huang Shi is an Australian, Chinese, German co-production telling the true story of a British journalist. What a combination. This gives the movie a very authentic feel, especially due to the fact that we hear as much Chinese as English (and some Japanese). If anyone has liked the movie Crouching Tiger, Hidden Dragon as much as I did (I think it is one of the best movies ever. One could almost call it a martial-arts fairytale), he or she will be pleased to see Michelle Yeoh and Yun-Fat Chow in the same movie (however no joint scenes). But this is not the only pleasant surprise of this quite enjoyable movie. The story is similar to Welcome to Sarajevo, only this journalist here, played by Jonathan Rhys Meyers (who is really good in this), is doing something even more courageous. He stays in the country to help the orphans. It is absolutely incredible what some people are capable of doing even when facing adversity at its worst. This is a story of someone who was capable of overcoming his own fear, of reinventing a life for himself and a group of orphan boys and creating a home for them. George Hogg, a young British journalist, arrives in China in 1937 finding the country being invaded by the Japanese. Air raids, floods of refugees on the streets, he´s afraid and thrilled at the same time hoping for the story of his life. He gets it only not the way he had hoped for. He soon sees himself in great danger and is led by an Australian nurse to Huang Shi. She leaves him there to struggle with famine, the depressions and aggressions of some 60 orphaned boys who have seen the worst and the insecurity of a life on the border of a war. In wonderful pictures we see him overcome the urge to escape and help those children transform the barren land around them into a fertile garden. He is assisted in this by a mysterious tradeswoman Madam Wang (Michelle Yeoh) who sells more than just seeds, by Chen (Yun-Fat Chow) the leader of a communist partisan group and of course the Australian nurse (Radha Mitchell) he is secretly in love with. When the Japanese and the air raids start to approach Huang Shi, Hogg must make a decision. He wants to flee and take the children on a journey over 500 perilous miles across the snow-bound Liu Pan Shan mountains to safety on the edge of the Mongolian desert. This seems almost impossible to achieve. The movie reminded me a little bit of The Painted Veil (no, it is not a war movie). Same beautifully filmed landscapes. And those sumptuous and, for us exotic, Chinese interiors of the time. The story is already quite captivating but the beauty of those landscapes alone would have been enough to enchant us. 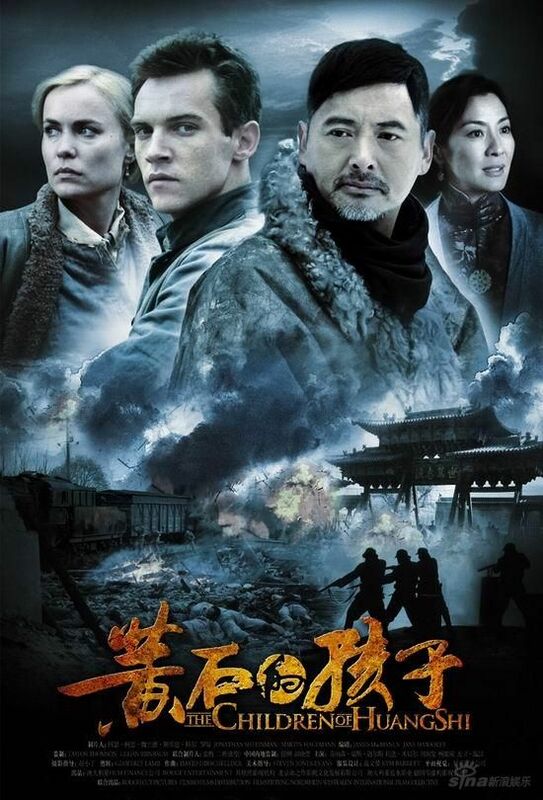 This entry was posted in Actors, Children and War, Reviews, Trailer, War and Journalism, War between Japan and China and tagged Children in War Movies, Crouching Tiger Hidden Dragon, Escape from Huang Shi, Japanese/Chinese war, Jonathan Rhys Meyers, Michelle Yeoh, Movie Trailer, Movies, Radha Mitchell, Reviews, War and Children, War and Journalism, War Movies, Yun-Fat Chow.